Before starting, you must have enabled the events you will be running. Please see our bracket configuration examples for additional information. 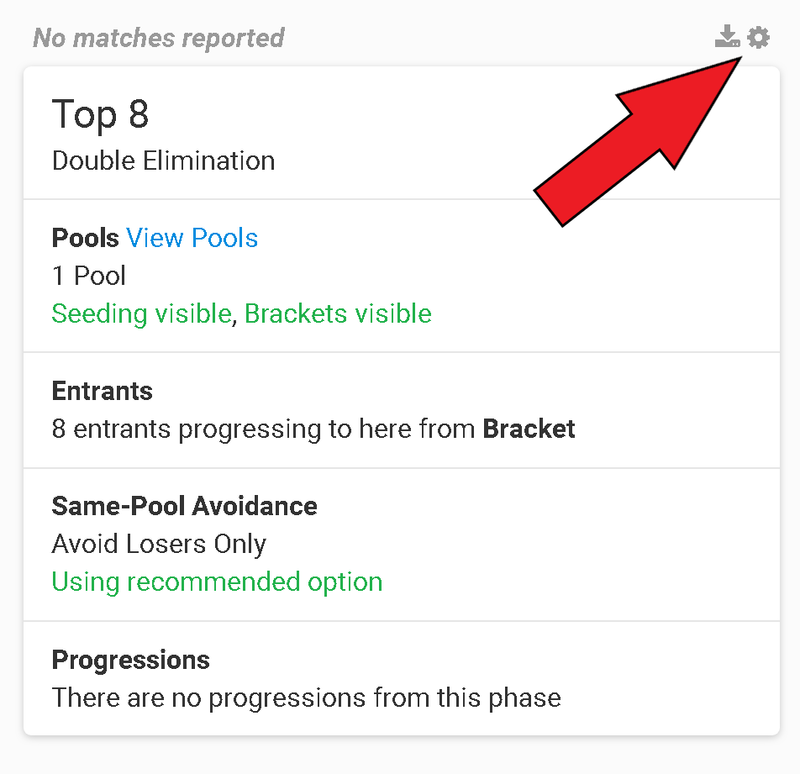 Go to your Tournament Settings by clicking Settings. Click on the section labeled Bracket Setup under the Events header of the Settings panel. Name and Bracket Type - Give each phase a name and choose a bracket type. Bracket types are listed and explained at the bottom of this article. Pools - Choose the number of pools for that phase. A single bracket (such as Top 64) will be 1 pool. Entrants - By default, entrants will be added to the first phase you created as they register for the event. Use the check boxes to change which phase entrants are automatically added to. Entrants progressing from prior phases will show up here as well. 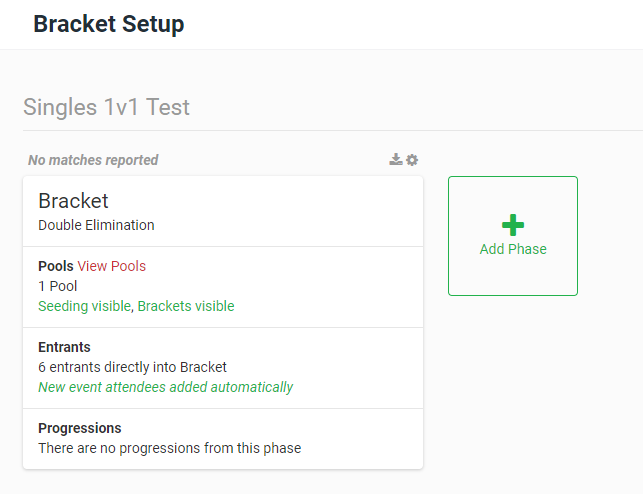 Progressions - Select the number of entrants progressing to the next phase per pool, as well as the phase they are progressing to. Progressions will be shown as the next phase's entrants. See our guide to setting progressions for more information. Complete this process for each event your tournament is running. Delete or restart phases by using the gear icon above the phase. Print your brackets on the Printing page. Single Elimination - Standard single elimination bracket where losing once eliminates a player from the phase. Double Elimination - Standard double elimination bracket where losing once drops a player to the losers bracket, and losing again eliminates them from the phase. Swiss - A round based system where every player plays each round and receives or loses points based on their match, and then plays another player with a similar number of points in the following round. In Swiss Format, every player does not play every other. For more information regarding Swiss, check out this article. Round Robin - Similar style to that of Swiss, but with differences. In Round Robin Format, every player does play every other. Also, there are no rounds in Round Robin play-style. 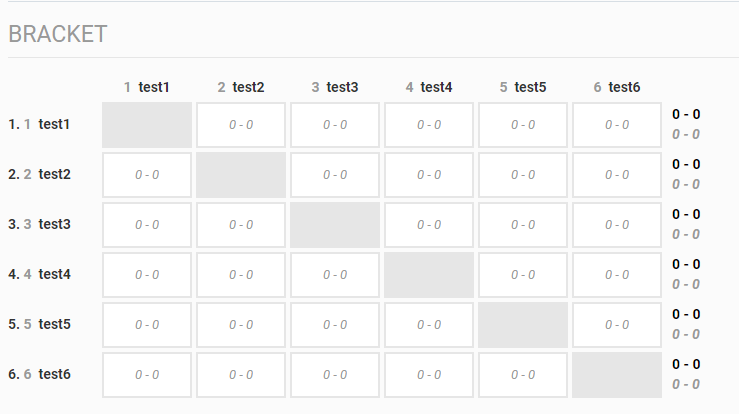 Custom Schedule - Match participants, number of rounds, and match times are all manually assigned by the tournament organizers. 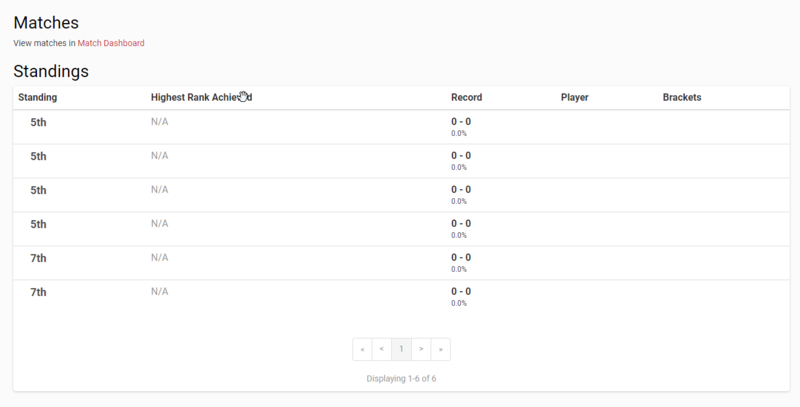 Matchmaking - Matchmaking is our Ladder-style of tournament formatting. Ladders are a live matchmaking experience that allow players at an event to continuously queue against new opponents, similar to how open matchmaking commonly works for online games. For more information regarding this, check out this article. Elimination Rounds - This option is currently only accessible for Fortnite, PUBG, Call of Duty: Black Ops 4, Halo 5: Guardians, Apex Legends and Overwatch tournaments. Elimination round brackets are multi-round events where groups of players compete against one another to earn points and progress to the next round. For more information regarding Elimination Rounds, check out this article. Note: Halo 5 and Overwatch do not have standard Elimination Round Settings that allow people to edit player(s) in the round, number of games played, or progressions.